Apples can be cooked using many methods. They can be cooked on their own and eaten as a side dish, or they can be cooked up to create recipes such as delicious apple butter. 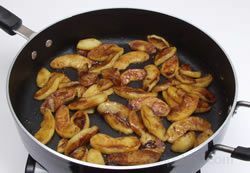 Also, to serve with meats, such as ham, pork, and poultry, try making Caramelized Apples as a side dish. Apples are also cooked in many desserts and baked goods. 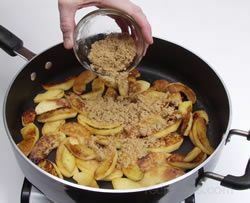 See how to make apple crisp for a scrumptious apple dessert or try a great Apple Bread Recipe to serve at coffee time. 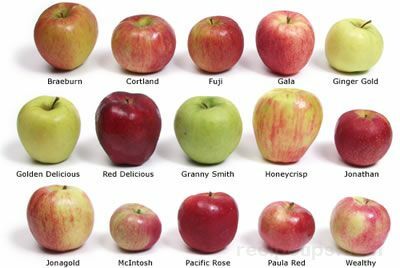 There are many different apple recipes and methods used for cooking apples. 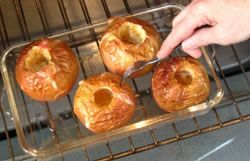 This article contains some basic apple cooking methods that you can try with your favorite apples. 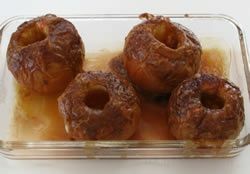 There are many recipes and different techniques used for baked apples. The apples may be left whole, unpeeled, and cores removed, or they may have a portion peeled and skins left on the remainder. 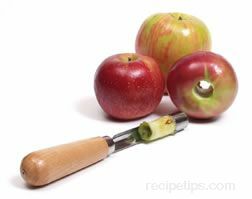 Some recipes will call for the apples to be cut in half first and then the cores removed. 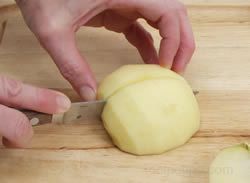 Generally the recipe will have some type of filling that is added to the cavity of the apple before baking. The filling may be as simple as butter and brown sugar or it may consist of a mixture of several ingredients, such as butter, sugar, brown sugar, syrup, honey, apple juice, water, cinnamon, nutmeg, dried fruit, and nuts. The recipe used below is just one of many using some of these ingredients. 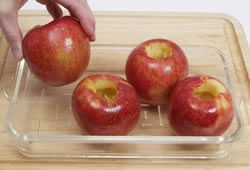 Remove the core, as shown in Apple Preparation, from four baking apples (see Types of Apples - Choosing the Best Apple for selection of baking apples). Score around the perimeter of the apple in several locations to prevent the skin form rupturing during baking. Place the apples in a baking dish with the blossom side down. 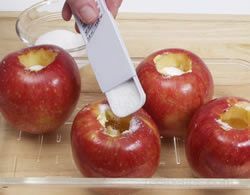 In the cavity of each cored apple place 1 tsp. of butter or margarine. Pour 1/2 tbsp. of sugar on top of the butter in the cavity of the apples. 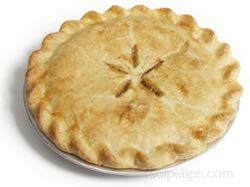 Bake for 50 to 60 minutes or until apples are tender when poked with a fork. In a small bowl combine 1/4 cup of brown sugar, 2 tsp. of flour, 1/4 tsp. of cinnamon, and 2 tsp. of water. Stir until well blended. Spoon mixture over the baked apples and place back in the oven for 10 to 15 minutes. Serve while still warm. 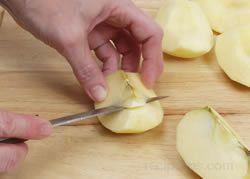 Apples may be cut into rings, wedges, or slices for frying. They may also be peeled or unpeeled, depending on the recipe. 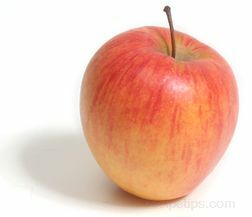 Apples are generally fried in butter and either white sugar or brown sugar, which helps them keep their shape. Some recipes will call for other ingredients, such as cinnamon, nutmeg, salt, egg, and water. 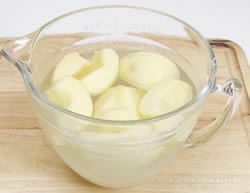 Sausage and bacon grease are also used in place of butter in some recipes when frying apples. 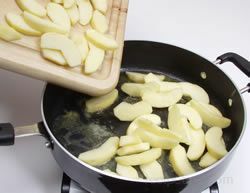 The recipe below makes a side dish of fried apples that goes well with ham or pork. 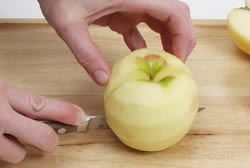 Peel four cooking apples (see Types of Apples - Choosing the Best Apple for selection of cooking apples). 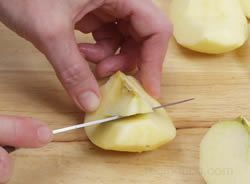 Cut apples in half and then into quarters. Remove the cores from each of the quarter sections. See Apple Preparation for more information on coring apples. 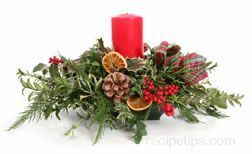 Cut quartered sections into slices 3/8 to 1/2 inch thick. 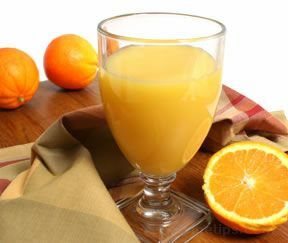 Place slices in water with lemon juice to prevent browning. Do not over soak slices. See Preventing Apples from Turning Brown for more information of preventing browning. 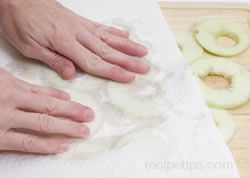 Drain the apples and pat dry with paper towels before adding to the skillet. Melt 2 tbsp. of butter or margarine in a large skillet until bubbling. Add apple slices. 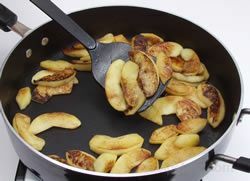 Cook apples over medium high heat for approximately 5 minutes or until tender crisp and beginning to brown. 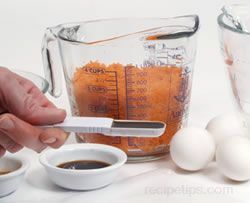 Turn several times to brown evenly. Add 4 tbsp. of brown sugar and continue to cook until sugar has melted and started to caramelize. Apple slices should be tender. Serve as a side dish while still warm. 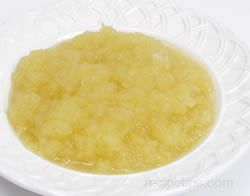 Applesauce is a popular food that is simple to cook and made with few ingredients. The basic ingredients consist of cooking apples, sugar and water. 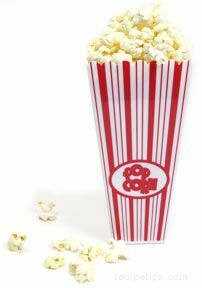 Other ingredients, such as cinnamon, nutmeg, cloves, lemon juice or zest, and apple cider, can be added to enhance the flavor. 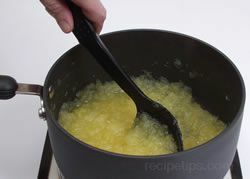 The recipe below is for a simple applesauce, using basic ingredients. 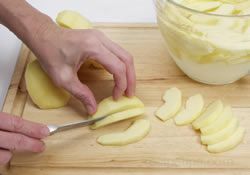 Peel five to six medium cooking apples (see Types of Apples - Choosing the Best Apple for selection of cooking apples). 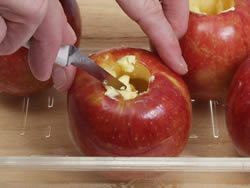 Cut apples in half and then into quarters. Remove the core from the quartered sections. 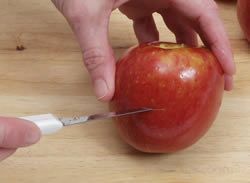 Cut quartered apples into thick slices. See Apple Preparation for more information on slicing apples. Place slices immediately in water with lemon juice to prevent browning. Do not allow apples to soak for more than 15 minutes. Add 1/2 cup of cold water to a heavy 2-quart saucepan. 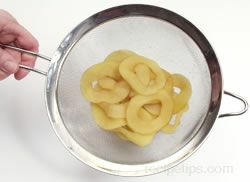 Drain slices and add them to the saucepan. Bring apples and water to a boil over medium heat. Cover apples and reduce heat to low. 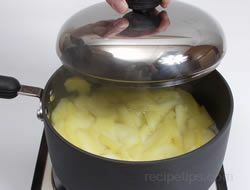 For chunky sauce simmer apples for 8 to 10 minutes. For smoother applesauce, simmer for 12 to 15 minutes. 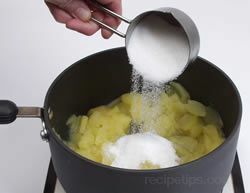 Add 1/2 cup of sugar during the last 2 or 3 minutes of cooking time. Stir sugar into the sauce and finish cooking to desired consistency. The applesauce can be served warm or chilled. Before storing in the refrigerator, allow the applesauce to cool and then place in a sealed container. 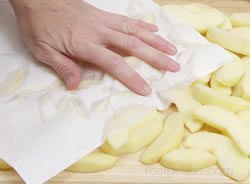 Drying apples removes the moisture from the apple, leaving it with a concentrated flavor. Dried apples make a sweet nutritious snack and are easy to store. They can also be reconstituted (see below) for use in sweet and savory dishes. 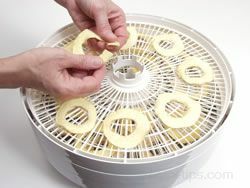 There are several methods that can be used to dry apples. They can be sun dried, oven dried, or dried in a dehydrator. The different methods are explained below. 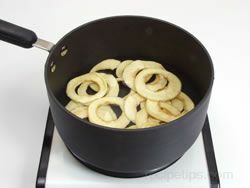 Rings - Peel apples and leave whole. 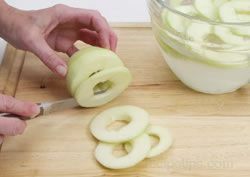 Remove the core and slice apples into 1/8 thick rings. See Apple preparation for information on coring the center of the apple. Slices - Peel apples and cut into quarters. Remove the core and cut sections into 1/8 inch thick slices. Place slices immediately in water with lemon juice to prevent browning. Allow the slices to soak for a few minutes and drain. Pat the slices dry with paper towels. 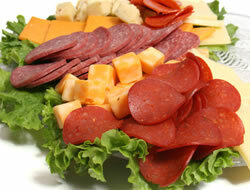 Place prepared slices or rings in a single layer on a wire rack placed on a baking sheet. Do not allow apple sections to be touching. Cover with cheesecloth and place in the sun in a well ventilated area. Turn slices every couple of hours. Bring apples in at night. 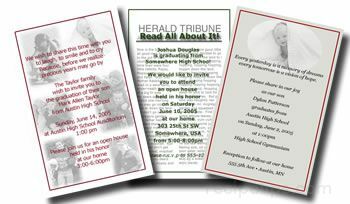 The drying process will take 2 to 3 days. This is not the preferred method for drying since it is slow and the drying process is hard to control. 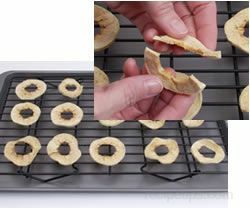 Place prepared slices or rings in a single layer on a wire rack placed on a baking sheet. Do not allow apple sections to be touching. 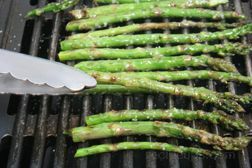 Place, uncovered, in an oven preheated between 125° to 150° F. Dry for 6 to 8 hours, turning after four hours and checking for dryness after six hours. If not dry, check again after two more hours. Apples are dried sufficiently when no moisture remains in the middle of slice when it is torn open. The dried apples will be pliable with a leathery texture. Prepare in same manner as above. 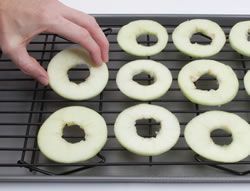 Place slices or rings on the trays of the dehydrator, being careful that the apples do not touch. 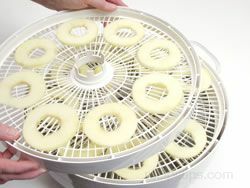 This allows more even air movement during drying time. See the dehydrator manufacturer's manual for suggested drying time. 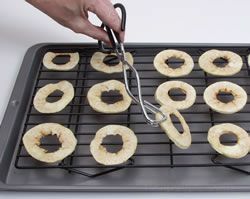 Turn slices or rings over about half way through the drying time and rotate dehydrator trays. After the apples have dried sufficiently, allow them to cool completely and then store in sealable plastic bags or covered plastic or glass containers. Store in the refrigerator or in a dark area where it is cool and dry. 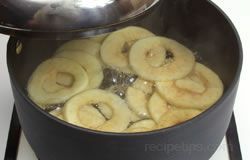 Place the dried apples in a saucepan and cover with an equal amount of water or apple cider. Should be enough liquid to cover the dried apples. 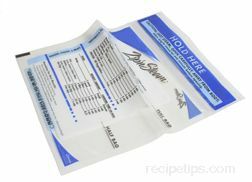 Bring liquid to a boil, cover, and reduce heat to a simmer. 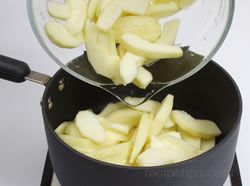 Allow to simmer for approximately 30 minutes or until apples are at the desired tenderness. Place dried apples in a heatproof bowl. Heat equal amounts of water or apple cider to a boil and pour over dried apples. 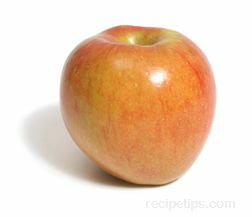 Allow apples to stand for 1/2 to 2 hours, until they are at the desired tenderness.